As most of you will know, our twin boys were born just after Christmas on 27th December (full story here) and although the neonatal unit was clad in Christmas decorations and lights we avoided the Christmas Day festivities, thankfully, spending the day in the comfort of our own home eating turkey and mince pies blissfully unaware of the world of beeping monitors, blood gases and ventilation that would soon engulf us for the next four months. Little did we know I would go into labour the very next day. 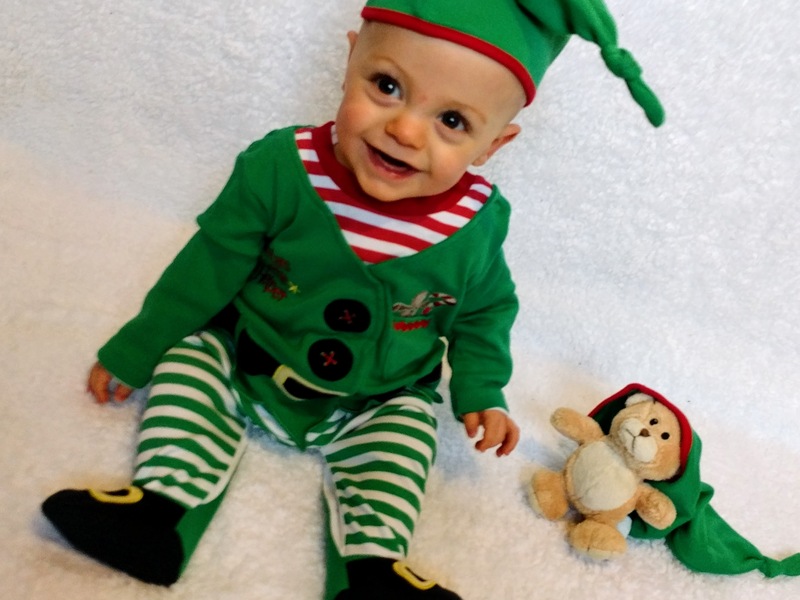 During Henry and Archie’s time in hospital we made many friends, some of whom did spend Christmas with their babies on the unit and the parents of one of his friends have kindly agreed to share their experiences for me to include in this festive blog post. “On 15th December we had a very unexpected visitor. 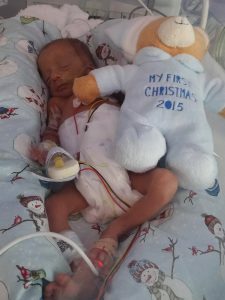 This wasn’t a salesman, but our premature baby boy, Stanley. Ever since Stanley was admitted onto The Oliver Fisher Unit we received nothing but hope, support, advice, tutorials, help, guidance, professionalism and knowledge. This wasn’t just from the superhero staff members, this was also a combination of other parents too. Even though, like everyone else, we were very worried about our child, this felt like a warm welcoming committee of unlimited positivity. Around the clock Stanley was attended to in every way with immediate secure staff competency. Plus the doctors walk around every morning, wasn’t a chore for us parents, but more of a hobby or interest. 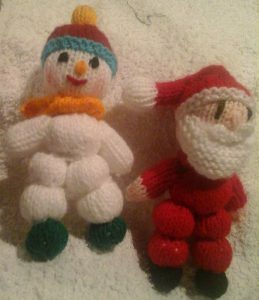 The build up for Christmas was approaching fast, and if we are honest, we cancelled Christmas prematurely before we knew less information on how this unit operates. During the festive period staff were quite often dressed up in hats, Xmas jumpers etc. this included the cleaners too; such a jolly bunch. That made us feel festive. They knew that we were in there for Christmas and knew we more than likely didn’t care for it at this worrying time, but they still persevered in making this a semi-fun experience. The decorations and tree were nice too, but I always felt hungry seeing their chocolates and biscuits at the desk! 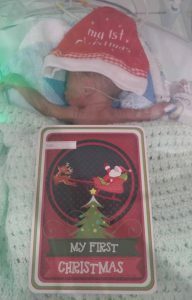 We were also granted permission to place a Christmas card on top of Stanley’s incubator, which was a nice gesture. But even though this seemed like a fun environment; the jobs, procedures and tasks were still completed to maximum proficiency. 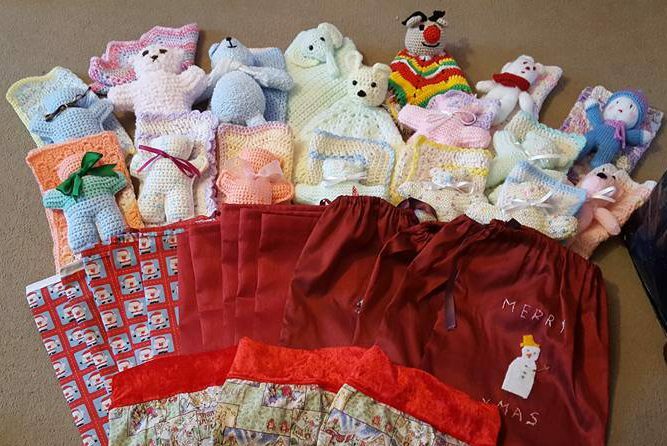 We visited Stanley on Christmas day and all children received a laminated photo of themselves and a Christmas message with a small sack of presents which consisted of a toy and a brush. No one wants to work Christmas day or even have a child in hospital over this time as this is a time for family and friends to gather, but having said that, the staff treated this as a special day and were as helpful and happy as ever. We left the hospital in the afternoon and returned on Boxing Day morning, after being advised by a staff nurse that having five minutes to ourselves would do us good. She was right, yes we were anxious to see Stanley and felt guilty we weren’t there all day, but looking back now, I can see exactly what she meant. This certainly wasn’t a case of just being another patient, this was an educational process which we found very elaborating. As for New Year. . . we were by Henry’s side at midnight, watching fireworks through the window behind his incubator and reading him some lovely stories; and there was nowhere else we would rather have been. New Year’s Day turned out to be extra special for me as it was the first time I was able to touch Henry and change his nappy, it’s amazing how something so basic can be so wonderfully fulfilling at the same time. I was finally able to do something to feel like a real mum and that alone was enough to make New Year special. Merry Christmas and Happy New Year from our little miracle!